Our Reno & Henderson locations offer VVG Vegas M Stick for our customers. Come by or contact us to help you pick the right vape pen for you. VVG Cannabis Concentrates is a family-owned and award-winning cannabis oil extraction company based in Las Vegas. With decades of experience, the team at VVG has become masters of extracting oil from cannabis to produce only the cleanest and healthiest product. They are a chemical and toxicant-free CO2 facility with their consumers best interest in mind and only source from the best local cannabis in Nevada. 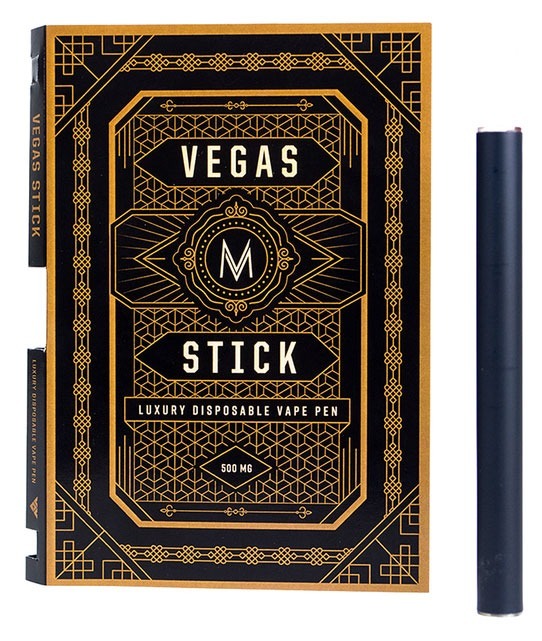 The Dispensary NV Henderson and Reno carries the VVG Vegas M Stick – a 500m luxury disposable vape pen that pays tribute in style to the ritz of the Las Vegas Rat-Pack era. The VVG Sativa, Indica, and Hybrid oil is a winner of the Jack Herer Cup – an event that celebrates one of America’s leading marijuana activists – Jack Herer. VVG oil is made with different variations of THC and CBD, and THC and CBN, and other select ingredients. CBD is fairly similar to CBN in the sense that neither gets you high in the traditional way THC does and they both are used for medicinal purposes. CBD just has MORE benefits and is used to treat MORE medical disorders. The Dispensary NV carries CBD VVG products, though it may vary by location. For more information, our staff in Las Vegas, Henderson, and Reno are happy to answer any additional questions.